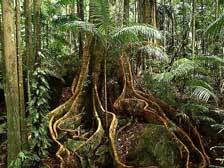 Australia is home to some of the most magnificent and unique rainforest plants in the world. A most versatile group of plants, they have ornamental, environmental and commercial value and can be used to create attractive backyard habitats, as indoor specimen plants, small-scale reforestation projects or large commercial ventures. Subtropical rainforest is found in high rainfall areas in rich volcanic soil. The forests contain 10 to 60 species of trees, the more common ones being the booyongs, yellow carrabeen, rosewood, figs and lillypillies.